Oh, yes. It isn't really a feud until Kanye West gets involved! 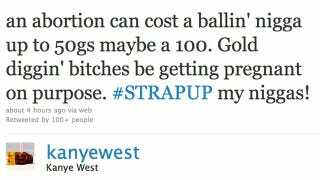 Today Yeezy reminded us that in all this talk about abortion, we're forgetting those who are hit hardest by the costs of an unwanted pregnancy. Won't someone think of the ballers? !